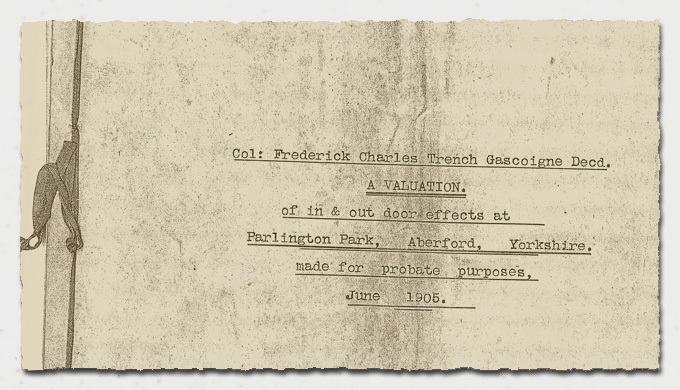 The following listing is a combination of two documents, the 1905 Valuation for Probate and secondly the Auction Catalogue, of the sale held from July 24th to 29th at Parlington. But before the listing is a newly acquired record from the local newspaper on the Saturday, the last day of the sale, about the auction. 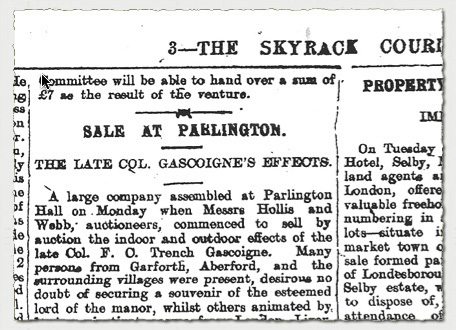 A large company assembled at Parlington Hall on Monday when Messrs Hollis and Webb, auctioneers, commenced to sell by auction the indoor and outdoor effects of the late Col. F. C. Trench Gascoigne. Many persons from Garforth, Aberford and the surrounding villages were present, desirous no doubt of securing a souvenir of the esteemed lord of the manor, whilst others animated by business instincts, came from London, Liverpool, Leeds etc. Nearly 2,000 lots were to be disposed of, and the sale was spread over the week. On Monday Mr J Stenson Webb, the officiating auctioneer, offered the contents of some of the corridors, the entrance hall, the drawing room, and the small drawing room. Bidding was brisk and good prices were realised. The hall contained several pieces of old Chippendale furniture, which formed part of an old drinking suite, used probably between 1780 - 1800. Had the suite been complete no doubt a very large figure would have been realised and the pieces excited considerable competition. a pair of fine quality Oriental vases and covers (one cover damaged), £105 0s 0d. and an ormolu empire striking clock, £8 8s. and a painted dinner service 13 guineas. ** Notes ** The text in this section is copied (tediously) from the original typed valuation produced in June 1905. It is accurate to the best of my knowledge, but like any transcript there are some uncertainties caused by mis-spelling, and other typographical errors. The layout of the document is generally in the form of a room, followed by a paragraph of the items contained within it; exceptions are where there are significant collections like silver in the room, they are listed separately after the main body of items. For clarity and to bring the document into line with the later auction document from July 1905 (which I hope to add in full, in the future), I have added a line break after each description in the manner of lot items at auction, although this does add considerably to the length of the document it is a lot easier to read. The original transcript makes use of a number of abbreviations to save time (examples: &c = e.t.c. Do, do, Ditto = same as item before). ** Author's Comments ** Where I have noticed any obvious errors I have added a comment in the following style: [comment] If the item is known, or is of some interest I have added a note to this effect. The auction catalogue, a photocopy, the original is at Temple Newsam has what appear to be pencil notes of the sale price achieved on the day, sometimes clear sometimes not; I have added them where possible. For example 10/- = 10 Shillings or 50p in todays currency. What that equates to in real terms I hasve yet to set out. ** Auction Reference ** Where the item is identified in the auction document of July 1905 it is noted in this style, along with extra data where available. Col: Frederick Charles Trench Gascoigne Decd. Of in & out door effects at Parlington Park, Aberford, Yorkshire. Lot 99 Pair of marble groups, Wolves. Lot 105 Chronological chart of Anglican Church architecture, framed. Lot 106 Two square footstools in old needlework. Lot 108 Thermometer by Davis, Leeds, under glass shade. Lot 109 Two bows and sixteen arrows. Lot 110 Pair of blue banners in needlework. Lot 112 Old muzzle-loading gun, two saws and bicycle saddle. Lot 115 Birch folding table. Lot 118 Two ditto ditto. Lot 119 Two smaller ditto ditto ditto. Unknown 52" x 40" Hunting Scene. Unknown 30" x 24" Portrait of a Lady. Unknown 30" x 24" Portrait of a Gentleman. Unknown 30" x 24" Portrait of a gentleman in full bottom wig. Interpretation of the Entrance Hall, based on the above data. We can get a pretty good idea of how the Entrance Hall looked internally by the description of items from the two documents (Valuation & Auction). For example maroon is the dominant colour of fabrics on the furniture and curtains. Remember the plan of the entrance hall is rectangular around 24ft wide by 30ft long. The access from the Porté Cochere is through a casement with a single door and fixed lights either side. There are no windows in the walls and it is single storey. Standing, as it were metaphorically, with your back to the entrance door; off to the right is an alcove for the organ, and directly in front at the end of the room, 30ft away is a single door opening leading to the corridor to the principal rooms. The alcove for the organ is roughly midway along the right wall, bisecting the space either side are two shallow semi-circular recesses; could each of these have had one of the carrara marble figures located. Opposite the organ on the other long wall, in the centre is a fireplace; most likely marble, was this the position of the marble and bronze clock, with the Greek figurine? The furniture comprising the Chippendale pieces along with a few other items, presents a very regal scene, and although large pieces, the room is plenty big enough to carry all the furniture. Adorning the walls would be the ten paintings, nine family portraits and the hunting scene. The floors were undoubtably stone, marble or limestone perhaps, evidence of marble skirtings and paving has been uncovered on the site, and is noted elsewhere in the artefacts section. Topping this off was the Brussels carpet, placed centrally with a border, given the sizes indicated of around 3ft, showing the stone paved finish. My view is that it is likely that the structure featured a flat roof behind the stone cornice at the head of the walls, probably lead covered, with perhaps a central lantern type roof light to illuminate the space below. Certainly without a roof light the entrance hall would have been very dark, especially as the maroon curtains would have obscured some of the light from entering by the windows either side of the entrance door. More to follow in due course! [Added: 10/05/2011] Small Drawing Room Auction data added, thanks to Pauline Robson for transcribing! Brussels carpet down all the corridors. Coloured engraving the Horse Fair. 2 sets of framed photos. 2 small paintings favourite horses. Large oil painting Seapiece & Man of War. Ditto Bolton Abbey in olden times. 4 rosewood chairs inlaid with brass. Coloured print & architectural drawings. Stuffed Amhurst pheasant in case. Views of India & photos. 2 pairs of crimson cloth curtains & valances. Easy chair inlaid with brass. Old oil pianting of birds. Signed photogravure Battle of El Gubat. Water colour drawing Cathedral interior & companion. Rosewood table inlain with brass. Oil painting copy of Raphaels Madonna. Unknown oil painting 3/4 length portrait of lady dgd. life of Christ 2 vols. Foreign silver gilt tankard on feet. Silver gilt cup Haigh Park. Geo [sic Georgean] circular tray vine leaf border full coat of arms. Two small waiters early Geo pike crest. Bread basket full coat of arms Geo period. 4 sauce boats & lids rams head handles. Muffinier with handles & cover pikes head & coronet. 36 table spoons Geo period fiddle pattern. 6 ditto ditto various pikes head. 35 fiddle pattern tea spoons. 2 caddy 4 salts & 2 mustard spoons. 4 gravy spoons 2 sizes. 6 salt spoons & 11 Geo egg spoons. 2 pairs of sugar tongs. Pair of old Geo sugar tongs. Salad fork and fish carving fork. 4 entree dishes covers & handles. Cut glass mustard pot, silver top. Mustard pot & two peppers. 4 silver basket decanter stands weighted. Large oval tray vine leaf decorations Geo. Hen with 4 egg cups. Early Geo salver on feet. Punch ladle Queen Anne coin. 6 early Geo table spoons. 12 table forks early Geo. Large embossed kettle stand & lamp. 24 pieces of fish eaters. Sugar basin & cream jug. 4 entree dishes & covers. Oak & electro plated beer mug. 6 cupp egg cruet 6 hole egg cruet. 2 oval dishes & liners. Pair of 3 branch candelabra. 4 wheel dog cart do. Brown horse aged 24 years. Shooting pony aged 15 years. Chestnut cob aged 17 years. Double set of plated harness. Single set of brown do. Single set of black do. 8 old sets of horse clothing. Sundry trinkets comprising pins, brooches, earings &c.
Tortoise shell box with miniature in lid. Bracelet set with 3 drops of enamel, pear & small diamonds. Two silver flasks & one leather do. 72 bott red wine bad. 12 bott Chateau Monto Rothschild. a53 bott port bottled 1885. 112 bottles Sandeman's port bottled 1889. 120 bottles dry sherry 1889. Old England vol 2, 1. The ferns of Great Britain & Ireland. Recollections of the Great Exhibition of 1851. A month in the midlands. Curry & Rice Illuminated Calendar 1846. A Fortnights Ramble in Ireland 2. History of Frederick the Great 6. Bryants Map of the East Riding of Yorkshire. Life of Charles Dickens 2. Holy bible revised version 5. Sketches in the Holy Land 3. Dalziels Illustrated Arabian Nights 2. A Fortnights Ramble in Ireland 3. Memoirs of Geo 3rd 4. History of the Reformation 5. History of our times 4. Sundry small books in cheffoniers. Sundry books on tables 28. Encyclopaedia Brittannica 8th Edtion 20. Sundry old books in book cases on landing about 500. History of St Peters York 2. 9 mahogany chairs in leather. Mahogany half circular serving table with brass rod & curtain at back. Rosewood tea caddy & bottles. Six bronze gas brackets & globes. Steel & iron fender, plate stand & implements. Marble mantel suite of clock & pair of side ornaments. Wood stand Old Turkey hearthrug. Pen tray & writing materials. Mahogany & 3 fold screen with wool work panels. Mahogany firescreen with glazed & movable panels. Pair of crimson cloth curtains valance & cornice. Stand for parrots cage & linoneum. Old long grand pianoforte by Broadwood. Small birch stand inlaid top. Hammered iron stand fitted with copper kettles & tea service. Mahogany two tier dumb waiter. Metal model of a sailing boat on stand under glass shade. 6 fold screen with painted panels. Two electro plated wine coolers. Mahogany wine cooler on carved feet. Antique mahogany extending dining table. 4 mahogany arm chairs with seats in leather. Small spirit cask with tap. Wm Mellor 24" x 36" A set of three lake views. Unknown large painting 72" x 72" Abraham & Isaac. H Verhoeven Ball 1862 33" x 46" Continental scene. F Wheatley 5ft 5 x 7ft 3 Grattans Parliament 1780. Unknown 28" x 24" Pair of portraits. Pompeo de Batoni Rome 1779 Life sixed [sized] portrait of Sir Thomas Gascoigne. The bordered Axminster carpet as planned. Rosewood writing table adjustable top. Small birch table with folding top. Rosewood writing table brass mounted. Oak chair upholstered back & seat. Valance cornice & pair of muslin curtains. Birch table with 3 drawers & tapestry cover. Folding side table & cover. Rosewood bookcase with marble top. Oak library steps & cushion. Nicholas Nickleby illustrated by Phiz. Fathers of the English Church 9. Flowering plants of Great Britain. Small ornaments on chimney piece. Stool on carved leg, ball & claw feet. Scissors & numerous writing materials. Portable kitchen & 3 copper sauce pans. Small mirror in carved gilt frame. Pair of terra cotta vases & 3 photo frames. Unknown 24" x 18" Favourite dog. Unknown 38" x 30" Portrait of an officer. Unknown 50" x 40" Portrait of two children. Sketch of an old gentleman in maple frame. Miniature portrait of a gentleman. Small oil painting of a lady. Miniature portrait of a lady. Two coloured engravings Right Hon Silver Oliver. Ditto portrait of a lady. Two small paintings lake & mountain scenery. Two oval sketches lady & Gentleman. Water colour drawing the infant saviour. The range of mahogany book shelves with cupboards and drawers as fitted to end of room. Ditto as fitted side of room. Mahogany gun cupboard fitted with drawers & glazed doors. Lady's double barrel hammerless gun. Two double barrel guns with top levers. A wild fowl gun by Holland & Holland. Sundry fishing rods & tackle, flies &c.
Bait cans & angling utensils. [end FCTG] Mahogany pedestal writing table. Mahogany arm chair in hair seating. 3 mahogany single chairs in hair seating. Small stool & mahogany stand. Old oil painting of a dog. Scale & quantity of chemicals. Large quantity of miscellaneous books. [end FCTG] Fishing rods in case. Iron fender, wire guard & fire implements. Small cupboard with bookshelf over. Oil painting of race horse Jerry. A number of wall placques. Two rosewood chairs inlaid with brass. Old oil painting The return from Hawking. Old Brussels carpet as planned to room. Chimney glass in gilt frame. 4 photos in oe frame. Old engraving the Melton Breakfast. Copy of oil painting portrait of a gentleman in military dress. Mahogany wash stand & toilet ware. Two pairs of yellow damask window curtains & cornice poles. Old engraving The dead Soldier. Engraving The Duke of Wellington. Mahogany 4 post bedstead, draperies, wool mattress, feather bed, hair mattress, 3 blankets, counterpane, bolster & two pilloes. Mahogany toilet glass Couch & cushions. [Catalogued twice?] Engraving The Duke of Wellington. Window curtains, cornice poles & valance. Mahogany 6ft 3 cabinet fitted with cupboards & drawers. Two copies of oil paintings family portraits. Copy of painting of Queen Victoria. Old oil painting artist unknown. photographs & coloured prints on wall. Brussels carpet as planned to room. Sketch in birds eye maple frame. Old engraving The Meeting od [f] Her Majesty's Stag Hounds on Ascot Heath. Mahogany 4 post bedstead & draperies two hair mattresses, feather bed, bolster & pillow. Old engraving The drowned Fisherman. Two Rosewood & Buhl Cabinets. pair of marble vases dgd. pair of tall vases, painted watteau style. Bronze figure on marble stand. Pair of terra cotta vases. Chess boards ivory chess men &c Smokers Companion. Rosewood & brass writing table. Two chairs with carved backs. Books & sundries in cabinet. Two books illustrated by Doie Endymon. Pair of stone carved vases. A red & white gold china plates & saucers 64. Vase stand & cover brown & gold. Blue & White Delft dish 2 Lowestoft dishes. 5 mugs & suacers painted in landscapes. 2 blue & white dishes. 4 oriental dish 2 dgd. 15 Lowestoft dishes & plates. 41 small pieces of china. 28 pieces of Lowestoft dinner ware. Blue & white centre vas. pair of butter pots & covers. 25 small pieces of china. 3 Sevres vases, 2 jardinieres & pot & cover. 5 blue & white plates & two baskets. Pair of Ruby Bohemian glass vases. Pair of green 7 white ditto. Pair of Chamberlain Worcester vases painted with landscapes. Pair of foreign pottery vases. 2 brackets & pottery vases. 3 columns surmounted by small bronzes. Pair of marble candlesticks & sundry ornaments. Two rosewood bookcases slightly inlaid with buhl. Two Oxford frames & photos. 4 Oxford frames & photos. 2 Oxford frames & photos. Old carpet on top landing. pair of yellow silk curtains. 7 Oxford frames & photos. Mahogany & inlaid card table. Old stairs carpet & rods. 5 old chairs & table. Small painted washstand & chest. Mahogany bookcase with drawers below. Remarks on scenery in Scotland 2. The land we live in 2. British wild flowers by Mrs London. The garden & other bound magazines. Poor Jack & others 9.
pair of candlesticks & 3 bronze chimney ornaments. 2 pairs of curtains & valances. Mahogany Tudor bedstead, palliasse, [hard straw mattress], mattress hair mattress. & feather bed, bolster &c.
Two pieces of carved oak. Small gilt frames in drawer. Sundries in chest of drawers. Antique mahogany card table with carved frame. 4 fold screen in gold wire work. Chimney glass Pair of carved wood candlesticks. Brussels carpet & felt on floor. Two pairs of yellow Damask window curtains & valances. 4 mahogany chairs in leather. Mahogany wardrobe The range of oak bookshelves. About 140 vols miscellaneous books. Quantity of photographic plates & chemicals. brass 3ft French bedstead & bedding. painted wood screen with needlework panel. Mahogany writing table & cover. Flask two daggers & sundries. brass mounted fender & implements. A number of travelling rugs. Two sets of paintings Italian figures. Oil painting 27 x 17 Seapiece. M[Matthew] Kendrick RHA 1863 30 x 15 Coast scene. Sibilla, Cumaea & Sibilla Delphica. Wm Mellor 24" x 36" On the Derwent. [See information on artist] Unknown 9" x 13" Copy of Farmyard Scene. Unknown 20" x 25" Pair of Continental Landscapes. Buhlmam Rome 1864 14" x 22" Landscape View of Naples. Unknown oval 28" x 23" St Cecelia. 10 Ameteur (sic) sketches in 3 frames. Unknown 19" x 14" Bather. Unknown 18" x 11" The Stepping Stones. Wm Mellor 16" x 12" Pair Waterfalls. [See information on artist] Unknown oval 28" x 24" Portrait of a Gentleman. Small watercolour sketch of child in cornfield. Small oval painting of Madonna. Unknown 10" x 8Â½" Girls Head. Small oil painting The Angler. Unknown 18" x 14" The Grape Crusher. Unknown 26" x 24" Oval Portrait of Lady & Child [FCTG] Unknown copy Madame Le Brum painting her own portrait. Mirror in carved guilt frame. Copy of an oil painting & glazed screen. Mahogany & inlaid pembroke table. Oak cupboard & lathe fittings. Two benches chair coal box & tables. Large quantity of photographic chemicals & printing frames. Needlework picture in guilt frame. Small bronze group lion & boar. 5 mahogany chairs with leather seats. Hearthrug & pieces of linoeum. Brass fire guard & implements. Fire screen in carved gilded frame. 2 mahogany chairs in hair seating. Red curtains cornice & valance. Cane seats & inlaid with brass. Set of 6 coloured prints[.] The Bramham Moor by H Watkins Wild. [See information on artist] Unframed painting by Leigh Samson Seascape. [Double Booked?] Mahogany centre table on carved & fluted frame. [Is this the billiard table?] Rosewood & inlaid chair. Cue rack & cabinet & cues. BOOKS [In the Billiard Room] Her Majesty's Army. A large number of old books. The range of mahogany bookcases. Camp bedstead & 2 feather beds. The Brussels carpet as planned. 2 pairs of window curtains. Mahogany 4 post bedstead, palliasse, hair mattress feather bed, wool mattress, bolster & pillows. Waste paper basket, inkstand &c.
Table with wool work top. Steel mounted fender & implements. Deal dressing table & drapery. Pair of Sheffield plated candlesticks. 5 Oxford frames & photos. Oil painting by F Cavalleri 27" x 20" A Queen [http://answers. Water colour sketch of flowers. Oil painting by A Roland Knight. uk/search?client=safari&rls=en&q=a+roland+knight+artist+landing+a+trout&ie=UTF-8&oe=UTF-8&redir_esc=&ei=kcW9TYzCF4uo8APW8IDKBQ] Pair of upright water colour sketches. Circular water colour sketch by N Rayner Boy & pet rabbits. [See watercolour from 1852]. Large glass in gilt frame. Curtains cornice pole & valance. Painted bedstead palliasse, wool mattress & feather bed, bolster & pillow. Mahogany writing table with adjustable top. Three oxford frames & photos. Two oil paintings by A Roland Knight Fish. [See earlier Google Reference] Two small water colour sketches. Two pairs of stag horns. Hearthrug, fender, implements & coal box. The range of ash bookcases. Iron Persian bedstead 2 hair mattresses, feather bed bolster & pillow. 3 Oxford frames & photos. Small oil painting mountain scenery. Water colour sketch Russian Monk begging. Oil painting by Roland Knight Fish. [See earlier Google Reference] Copy oil painting, Joseph & Mary & Infant Saviour. 2 mats & gas bracket & smoke bell. The Brussels carpet as laid. Rosewood & inlaid cane seated chair. 2 pairs window hangings, & cornice poles & valances. Mahogany bedside pedestal with table gtop with two fall leaves. Antique Mahogany card table on carved frame. Mahogany 4 post bedstead hangings & palliasse feather bed & hair mattress. Water colour sketch Swiss Mountain Scenery. Two Mahogany chairs with leather seats. Iron persian bedstead, palliasse, feather bed, bolster & pillow & hair mattress. Pair of curtains and poles. Five oxford frames & photos. [Note the typist must have been made aware of the use of the abbreviation "do" that is, ditto. For those unaware of this expression, which I came across decades ago during lessons in Quantity Surveyingâ¦ whew! Essentially it is used to save re-writing the keyword. The above details of the items in Bedroom 4 like many other rooms feature, "Mahogany" regularly, so to avoid typing the word over and over you use the abbreviation "do" or "ditto" to say that it is basically the same I.
class of wood in this case, but the piece differs in that it is a rail, or table etc. Old table & two tin boxes. Deal table & two stools. Cane seated chair & lamp. Fender & implements & kettle & stand. The tapestry carpet as laid. Crimson stair carpet to red room. Beech & inlaid snap top table. 13 various empty gun cases. A number of negative cases. Mahogany camp bedstead & bedding. 3 small deal top stands. Mahogany cabinet fitted with 9 drawers. Invalids wheel chair & cushion. Wire guard & foot hassock. Wall bookshelf & 24 vols of books. Mahogany 4 post bedstead, box spring mattress, hair mattress, bolster & two pillows. Two oil paintings copies of family portraits. Picture of birds with feathers. Mahogany & inlaid table movable top. Two mahogany wall book cases 90 vols of books. Perforated steel fender & implements. Set of 3 blue vases. Wood carving of Angels head. 6ft wardrobe fitted with bureau. Beech wood table or plant stand. Water colour sketch portrait of 2 young ladies [Peris of the North?] 12 small pictures & photos. Coal box & wire guard. Picture, portrait of two young ladies. Grand piano case fitted as cabinet. About 30 vols of books. Odd books & A [q]uantity of sundries. 17 various small framed prints &c.
Antique Mahogany cammode [sic] painted washstand & towel rail. 2 oak chest of drawers. No 2 Two iron bedsteads & mattresses. About 50 old broken chairs 3 painted tables. Two old brass warming pans. Steel fender irons & rug. mantel glass & gas bracket. Mahy [mahogany] chest of drawers. Mahy [mahogany] pedestal & commode. 2 gas brackets & 2 pairs curtains. Steel fender & coal box. 4 various brass table lamps. Two blue china & brass lamps. Mahogany & brass bound wine cooler. About 100 various wine glasses. Painted & gilt dessert service of centre dish. 15 plates & 2 ice pails. Brush foot warmer & sundries. 15 pieces of old decorated tea ware. 2 teapots & odd china. 23 pieces of Copeland Felspar teaware. Coffe pot & tea pot. Blue teapot & odd china. Six dozen large table knives. Long table two salmon preserving casks. Box full of old books. 2 boxes & pair of steps. Mahogany leaf case & spare leaves. Old mahogany sofa & cushions. Mahogany Pembroke table & cover.
? Oak snap top table. Pair of tall antique mahogany corner cabinets. Old engraving Christopher Wilson Esq. 2 old oil paintings copies. Antique mahogany chest of drawers. Piece of matting& fibre mat. 2 pairs of cornices & curtains. Enamel flour bin & bowl. China dinner service painted with flowers. Sundry parts of dinner service. Game pie dish & sundries. Trout dish vase, jardiniere & sundry crockery. 10 Oriental cups & suacers. Drab tea set maroon border. 4 large copper vessels . 7 large copper pans. LINEN &c 68 pairs linen sheets. Large quantity of old house linen all marked. Ptd [painted] dressing table & mirror. Two ton roller (1 shaft broken). Turnip drill. 3 sets of iron harrows. India rubber pipe for pump.
. Quantity of plough fittings. Spades, forks & other tools. Sitting boxes & old cask. Old milk cans & sundries. Small quantity of chicken corn. A small lot of hay. Rope & wheels for stack covers. & belts & gearing for same. Small quantity of old potatoes. Bullock weighing machine by Avery. Bellows, anvil, vice, quantity of iron, horse shoes, & sundry Blacksmiths tools & implements. Lathe & fittings fret saw. Small stack of wheat do. Old horse for wood cart. Sow in pig sow & nine pigs. [FCTG ] 13 young guinea fowls. 6 game cockerills [sic]]]. 70 hens & pullets. 2 wood & iron garden seats. Small hand fire engine & hoses complete. All the contents of the greenhouses, comprising various plants, carnations, cineraria, crotons, dracaena, ferns, geraniums, gloxinas, axalias, & numerous other stove & greenhouse plants. We hereby value the articles enumerated in the foregoing Inventory at the sum of Four Thousand, Seven Hundred and Eighteen Pounds, Fourteen Shillings and Two Pence.